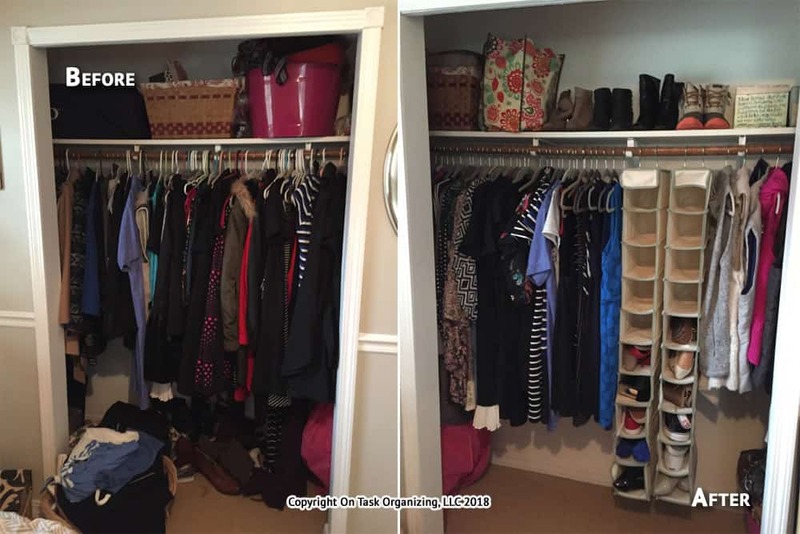 This Cary woman’s walk-in closet was decluttered and organized by On Task Organizing. Notice how replacing all of the hangers made a huge difference. 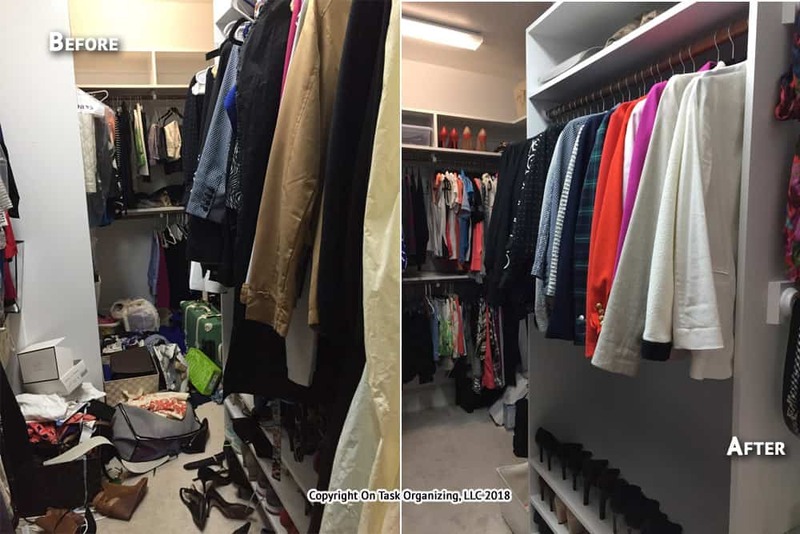 Decluttering and organizing helped a Cary woman easily reach her business clothing and shoes, saving her much time each morning. 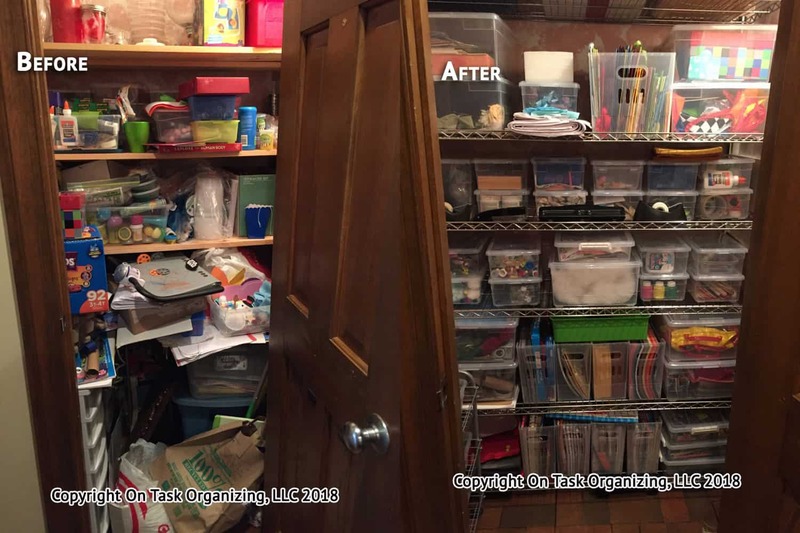 This Raleigh arts & crafts closet was decluttered and organized by On Task Organizing. Organized clear bins make it easy for this family to find crafting supplies. A Holly Springs garage organized by On Task Organizing. Decluttering and organizing created space to park one car. A Durham guest bedroom organized by On Task Organizing. Decluttering & organizing allowed family members to visit the following week. 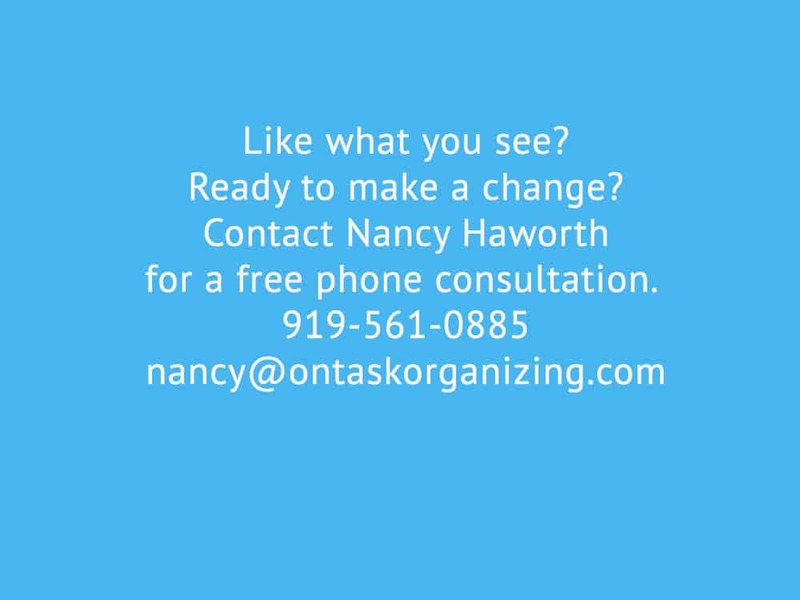 On Task Organizing helped a Raleigh empty nester with decluttering and organizing a grown child’s former bedroom. The room can now be used as a guest bedroom. A garage organized by On Task Organizing. Decluttering and organizing created space to park one car, and also access to the washer & dryer. A Raleigh dining room decluttered by On Task Organizing. 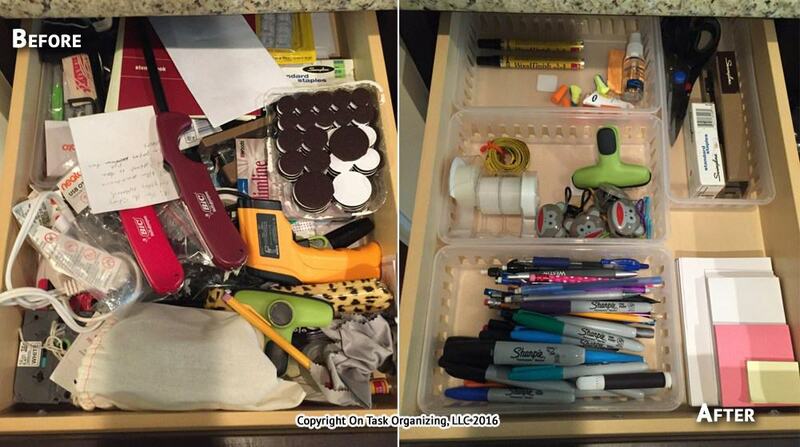 Before and after photos of a junk drawer in a Cary kitchen organized by On Task Organizing. A Raleigh master bedroom that was decluttered and organized by On Task Organizing. A Willow Spring dining room that was decluttered by On Task Organizing. Finding homes for decorations and excess items that had gathered on the table, quickly made this dining room ready for a family to enjoy a meal together. 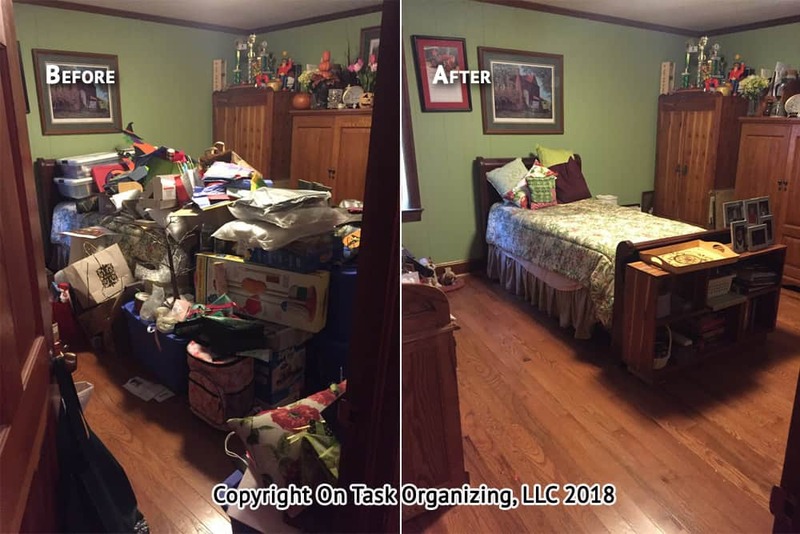 This desk was decluttered and organized by On Task Organizing in a North Raleigh home. It is now much easier for this homeowner to manage paperwork. 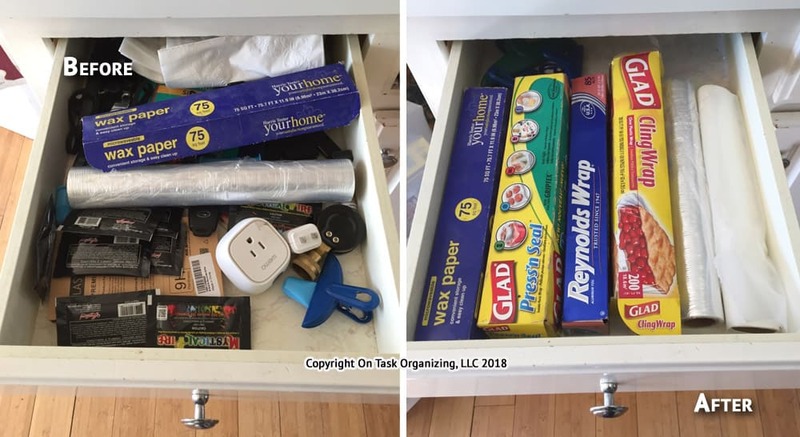 An up close look at a desk drawer decluttered and organized by On Task Organizing, using a drawer sorter the client already owned. 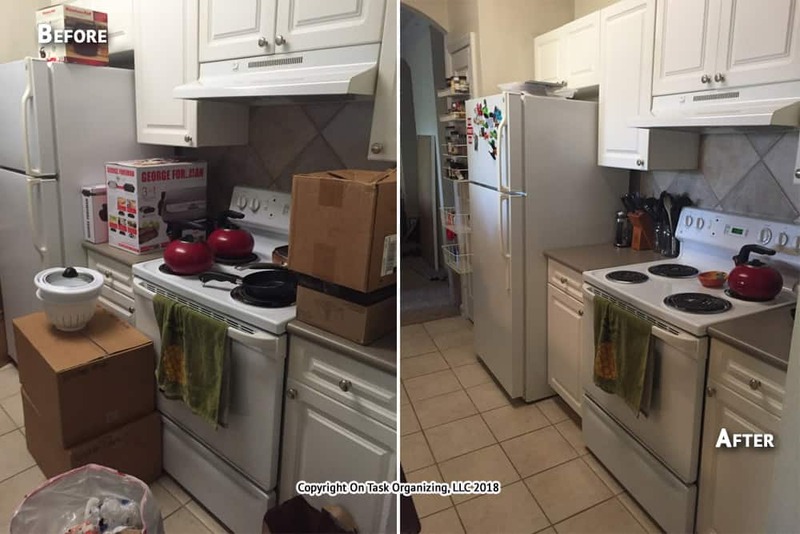 On Task Organizing helped a newlywed couple to combine homes and unpack in this North Raleigh apartment. The couple had 2 of many things, including kettles. Excess items were donated, and the kitchen items they needed were quickly unpacked and arranged in a organized way so they could settle in and begin cooking. 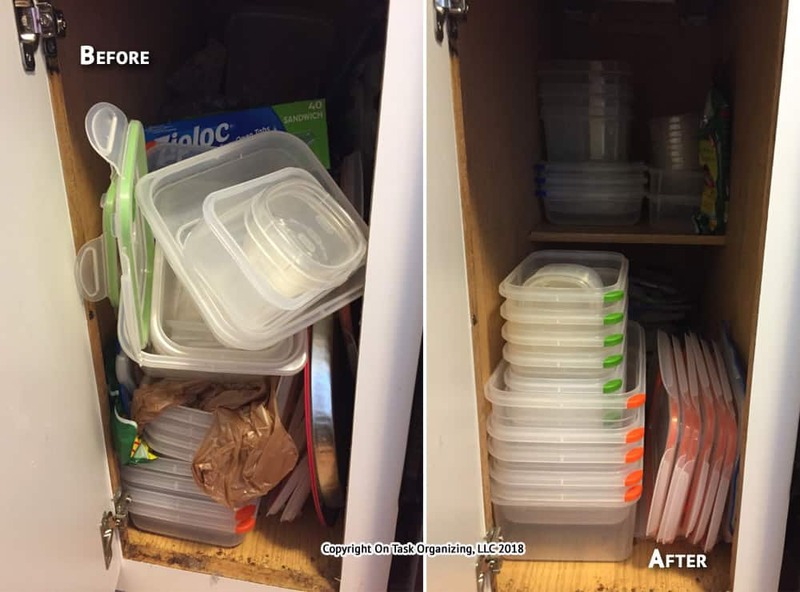 This small tupperware cabinet was decluttered and organized as part of an entire kitchen organizing project with On Task Organizing in a Raleigh home. Packing leftovers will be much easier! 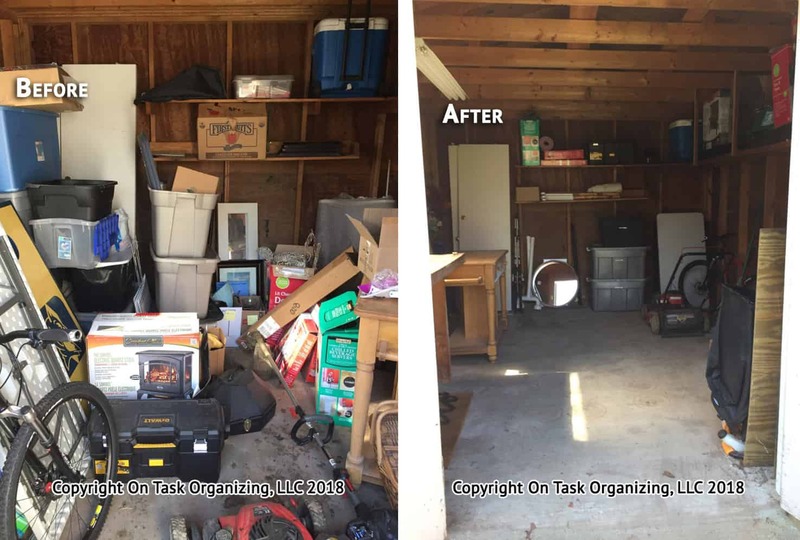 This North Raleigh shed was decluttered and organized by On Task Organizing. The homeowners can now use this space for working on gardening projects and storing yard work supplies. This kitchen junk drawer was repurposed to hold only foils and wraps in this North Raleigh home. 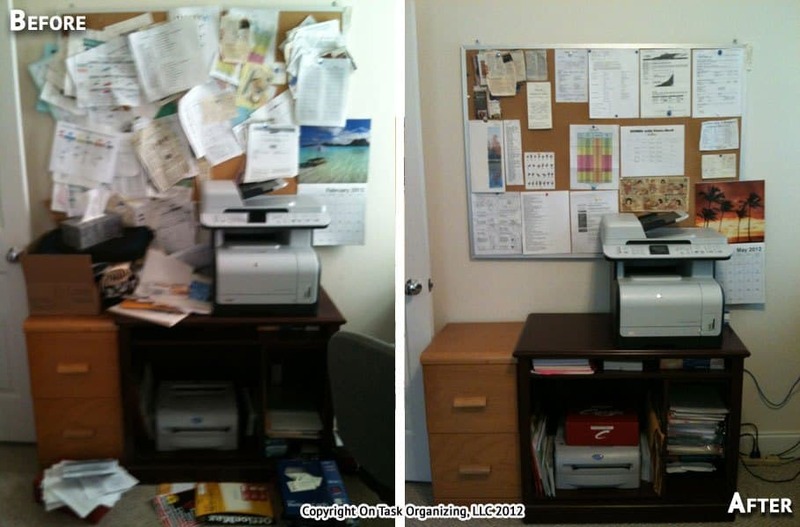 A New Hill office bulletin board, printer stand and file cabinet organized by On Task Organizing. Decluttering and reorganizing this area made it easier to use this home office. 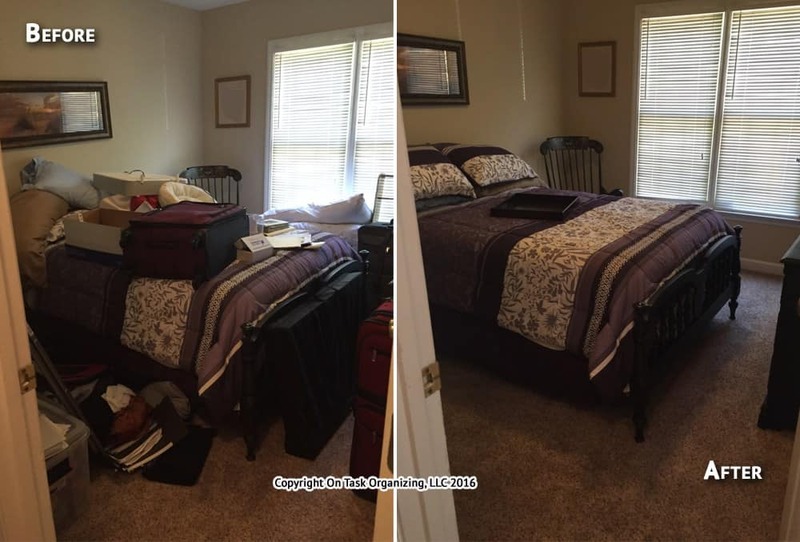 A Raleigh master bedroom decluttered and organized by On Task Organizing. 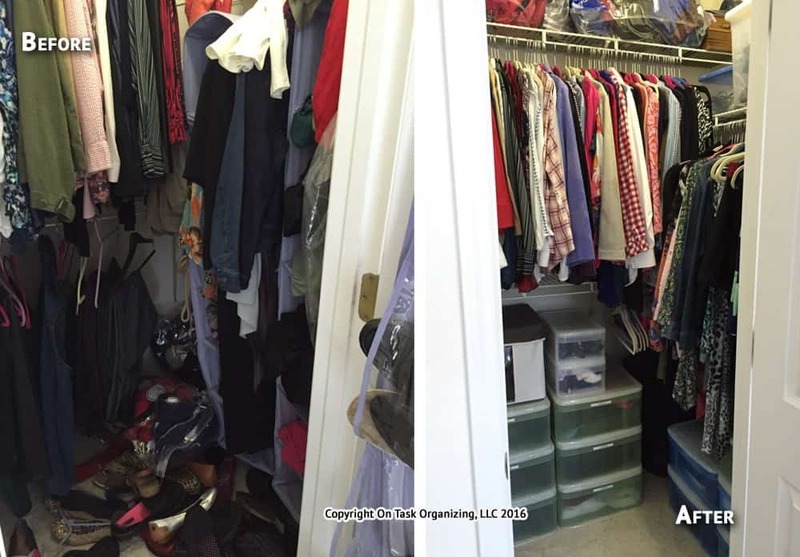 A Raleigh woman’s closet decluttered and organized by On Task Organizing. 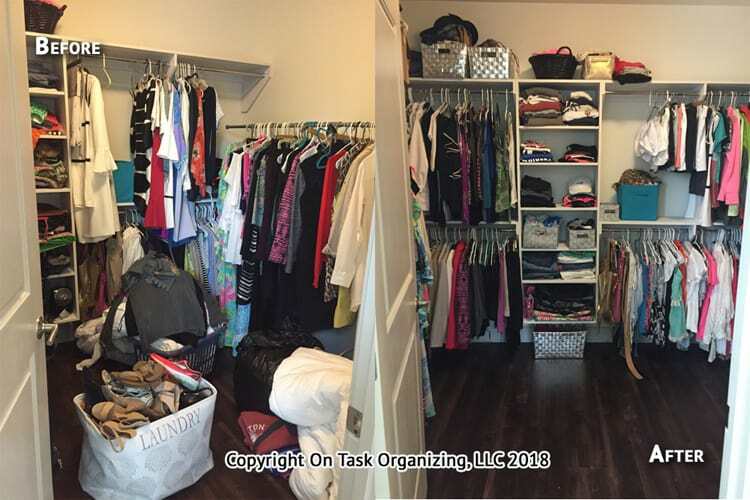 A Cary spare room organized by On Task Organizing. The contents of the spare room had become overwhelming to the home owners. After organizing, this room can be utilized again. 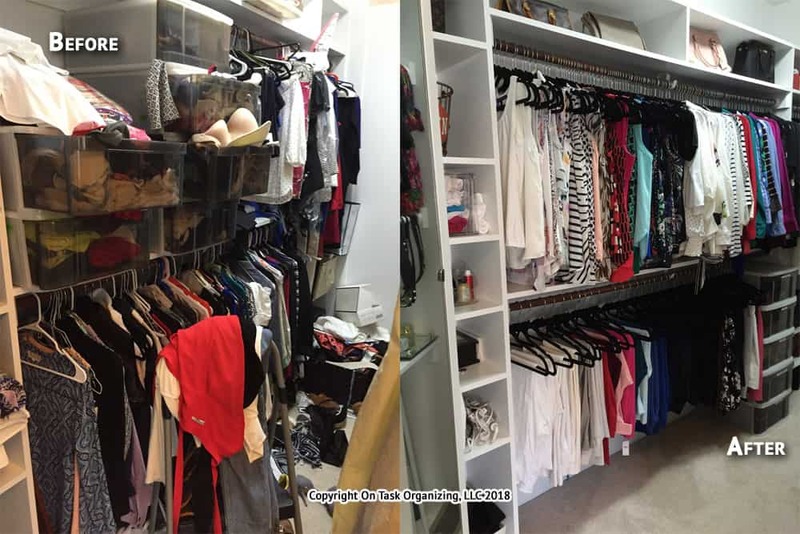 A Cary gift closet organized by On Task Organizing. 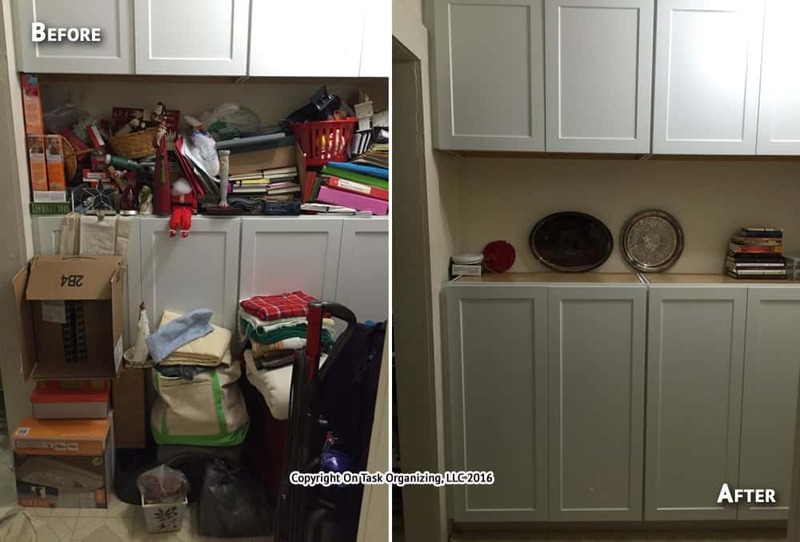 A great amount of space was reclaimed after sorting through this closet. A North Raleigh home office unpacked and organized by On Task Organizing. This gave the client immediate access to his books after moving. A Cary living room coffee table decluttering project by On Task Organizing. The quick process of decluttering the coffee table created a neater and more welcoming space for visitors. A Raleigh guest bedroom & home office area that was unpacked and organized by On Task Organizing. This allowed my clients to quickly settle in and enjoy their new home. A Raleigh living room/office area after an organizing session with On Task Organizing. All toys were moved to another room to create a designated playroom. This space can now be used as an office and workout area. A treadmill decluttered during a bedroom organizing session with On Task Organizing. A hallway cabinet area decluttered and organized by On Task Organizing. 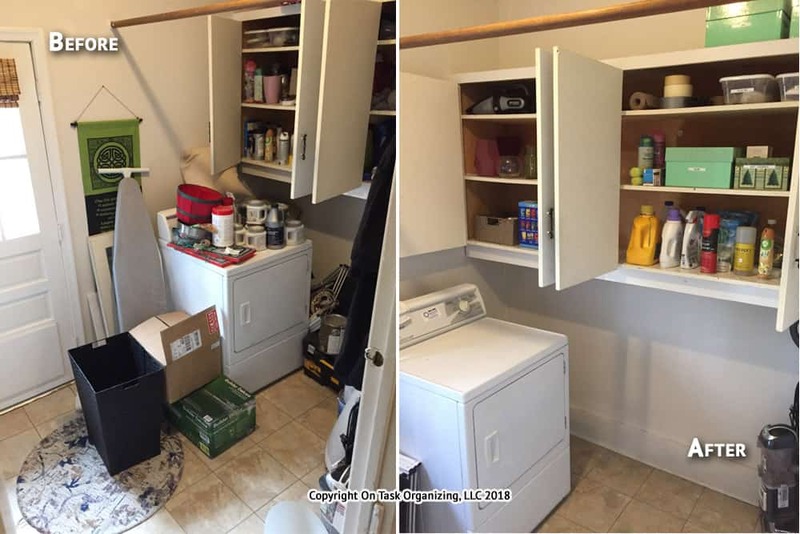 The laundry room and cabinets were decluttered and organized by On Task Organizing in this North Raleigh home. A Raleigh bathroom cabinet decluttered and organized by On Task Organizing using only storage supplies the homeowner already owned. A Raleigh shoe collection organized by On Task Organizing. Before, shoes were spread on the closet floor and in hanging shoe organizers that were difficult to access. After, all shoes are stored in cubbies in stackable shoe organizers. 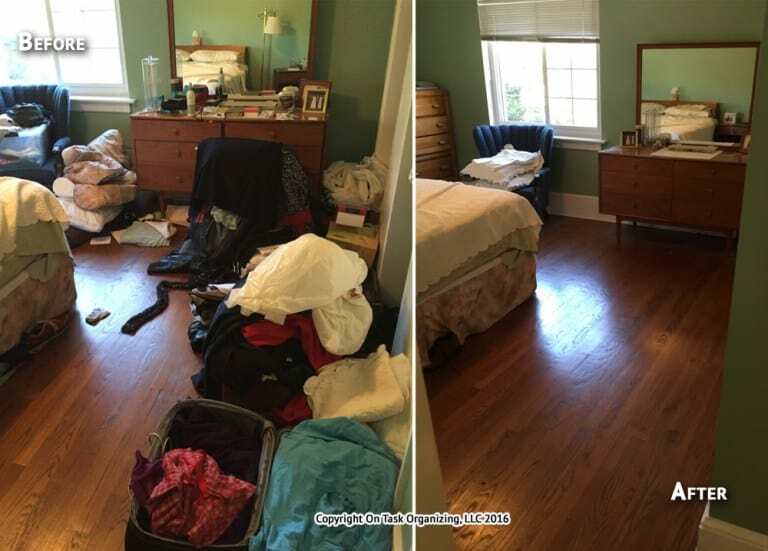 A Wake Forest guest bedroom decluttered and organized by On Task Organizing.